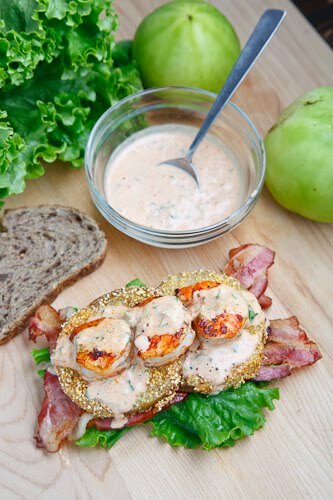 A twist on the classic BLT swapping out the ripe tomatoes for crispy cornmeal coated fried green tomatoes and adding blackened shrimp and a tasty remoulade sauce. Over the last few days I enjoyed some blackened swordfish and that reminded me of the blackened shrimp in the fried green tomato with shrimp remoulade po’boy that I often make while green tomatoes are available. The fried green tomato BLT sandwiches were still on my mind and I was craving more of them. With that thought the gears started to turn and I had a new idea; how about a fried green tomato BLT sandwich with shrimp remoulade? Once I got that idea stuck in my head there was little that could stop me from making them and I certainly glad that I did! I mean you really cannot go wrong adding plump and juicy shrimp seasoned with a tasty blend of herbs and spices with a touch of heat to an already great sandwich! Soak the green tomato slices in the buttermilk for at least 30 minutes at room temperature. Mix the masa harina, cornmeal and creole seasoning and place it in a wide and shallow dish. Pull the tomato slices out of the buttermilk and dredge them in the cornmeal mixture. Fry the tomato slices in oil over medium heat until golden brown on both sides, about 3-4 minute per side and set aside to drain on paper towels. Toss the shrimp in the oil and creole seasoning to coat. Heat a pan over medium heat add the shrimp and saute until cooked, about 2-3 minutes per side. A beautiful BLT! Just to die for. This looks so good! I'm going to have to try this. Does having the shrimp and the remoulade on the top make the bread soggy? This looks incredible! Just recently discovered your blog and I am loving it!! I love how fresh and bright the colors are! What a great farewell to summer meal. 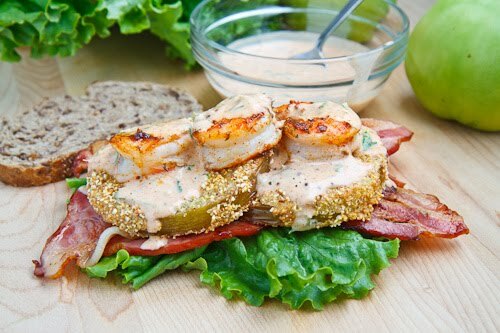 Yum.. all of my favorite things.. bacon, shrimp, fried green tomato, and remoulade sauce. Sounds like heaven. Hi Kevin! I've been a bad blogger friend and haven't stopped by in a little bit, so I am back to catch up on your awesome recipes! My husband would go crazy over that sammy – I am totally going to surprise him with that. You are the absolute king of sandwiches. I swear. Oh, how I love fried green tomatoes. Paired with shrimp in this gorgeous sandwich, I'm not sure what could make it more tempting. Honestly Kevin…I'm pretty sure you could open up a sandwich shop with all of these fabulous ideas! It's almost impossible to improve upon a good, basic BLT. I said almost…I think you might have done it. Looks absolutely delicious. Many favorite ingredients converging in one big fabulous sandwich! Very nice take on the BLT! It looks so delicious, yet simple at the same time that it probably won't break your budget like other recipes! Thanks for sharing Kevin! I love doing fried green tomato sandwiches. I actually had a plan for one this summer but I was so pokey in getting around to it that my tomatoes sadly ripened on me. Next year! oh my god, that looks so great! I think I might croak if I don't get one of these SOON! The combination of ingredients is genius!